See all that John McCain has done in his long career. Senator John McCain passed away Aug. 25, 2018, after announcing he was ending treatment for his brain cancer. McCain had recently stepped down as the chairman of the International Republican Institute after holding the position for 25 years. He served as an Arizona senator and was a veteran who had run for president in 2000 and 2008. Sen. John McCain passed away due to brain cancer on Aug. 25, 2018. He was a politician, veteran and a published author. The one-time presidential candidate’s family announced on Friday, Aug. 24, that McCain had discontinued medical treatment for brain cancer. Click to read more about the 81-year-old Arizona senator’s net worth and his career as a politician. Senator McCain’s own most recent and final tweet reflected his dedication to U.S. military service members. It was a message of condolence from him and his wife Cindy to the family of Chief Warrant Officer 3 Taylor J. Galvin, who was killed in a helicopter crash in Iraq. 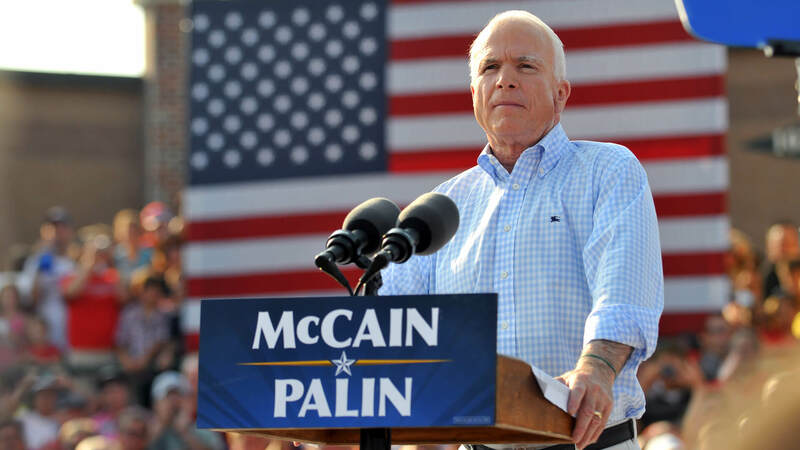 After leaving the Navy, McCain immediately transitioned to a life in politics. In 1982, the Republican was elected to the U.S. House of Representatives from Arizona, and was re-elected in 1984. In 1986, he was elected to represent Arizona in the U.S. Senate. He also served as the Chairman of the Senate Committee on Armed Forces. As senator, his key issues included cutting down on regulations placed on farmers, protecting the right to bear arms, reducing the federal debt and deficit, improving the Armed Forces, ensuring Americans have access to affordable healthcare, securing the nation’s borders, supporting tribal sovereignty and self-governance for Native Americans, increasing the availability of communications services to all U.S. households and improving care for veterans. The 2018 standard salary for a member of Congress — whether in the House or Senate — is $174,000. As McCain did not have any notable business ties, this is likely the largest driver of his net worth, which Celebrity Net Worth reports at $16 million. He did earn $1.7 million in book sales in 2007 according to TheRichest; however, all of that money was donated to charity. His other significant earnings have come from the sales of various properties. McCain vied for the Republican presidential nomination in 2000, but was defeated by George W. Bush. He tried again in 2008 and became the Republican nominee — with running mate Sarah Palin by his side — but lost the presidency to Barack Obama. John McCain was diagnosed with brain cancer during the summer of 2017. The politician was seeing his doctor at the Mayo Clinic in Phoenix for a routine checkup when it was discovered that he had a blood clot over his left eye. Days after his operation, McCain was told he had glioblastoma, an aggressive form of brain cancer. Doctors told him the prognosis was not good. McCain wrote his newest book, “The Restless Wave: Good Times, Just Causes, Great Fights, and Other Appreciations,” after being diagnosed with brain cancer in July 2017, NPR reported. In the book — a Publisher’s Weekly Bestseller — McCain discusses how important it is for Americans to look past their political divides for a greater good. “I want to urge Americans for as long as I can to remember that this shared devotion to human rights is our truest heritage and our most important loyalty,” he wrote in an excerpt published by NPR. McCain said he was inspired to continue working through his cancer treatments by the late Sen. Ted Kennedy, who had the same type of brain tumor. Though he persevered, after the prognosis, McCain eventually decided to take a step back from politics. On Aug. 3, 2018, the Washington Post reported that McCain had stepped down from his position as chairman of the International Republican Institute. Alaskan Sen. Dan Sullivan took his place. Following in his father’s footsteps, McCain spent the first 23 years of his career in the Navy. He graduated from the U.S. Naval Academy in 1958 and the National War College in 1973. He served as a Navy pilot from 1958 to 1981. Terrifyingly, North Vietnam took him as a prisoner of war in 1967 and held him captive for more than five years, finally releasing him in 1973. Kept in solitary confinement for part of his imprisonment, McCain endured torture and beatings at the hands of his captors. Married to the senator since 1980, Cindy McCain — born Cindy Lou Hensley — is heiress to a beer empire. As the recipient of her father’s shares of Hensley Beverage Company, the leading distributor of Anheuser-Busch beverages in Arizona, she took over as chairman of the board upon his passing in 2000. Cindy McCain’s net worth of $300 million makes her significantly wealthier than her late husband. Also a philanthropist, McCain dedicates her time to numerous charities. She’s the co-chair of the Arizona Governor’s Council on human trafficking and the McCain Institute’s Human Trafficking Advisory Council. A father first, the senator is survived by seven children and five grandchildren. He adopted his oldest two children — Doug and Andy — with his first wife Carol. The couple also had daughter Sidney before they divorced in 1980. McCain’s four children with Cindy — who is 17 years his junior — include daughters Meghan and Bridget, and sons Jimmy and Jack. Of all McCain’s children, daughter Meghan has stolen the spotlight. The outspoken blonde is a co-host on “The View” and an ABC Politics analyst. Click to keep reading about what’s keeping past presidents and vice presidents wealthy. Gabrielle Olya and Lorina Morton contributed to the reporting for this article. McCain left a legacy of service and charitable donations.